Kolar Gold Fields or K.G.F. I came across a very interesting book that had some info on KGF, so I decided to pinch with apologies to the author and share notes with you all. Sad, till date have not received any old photographs of KGF to add to this page. "Tips for Tourists, Extracts from: A Guide to Bangalore and Mysore Directory, 1905. Compiled and Published by J.W. Morris"
The Kolar Gold Fields ... these are to the south of the Bowringpet Taluq, to the east of a low ridge of hills of which the Betarayan Hill, 3199 feet above sea level is the most conspicuous point. They are connected by the Gold Fields Railway with the Bangalore-Madras line at Bowringpet, and a road runs through them from Bowringpet to Kamasandra, where there is also a railway station. There is no Hotel at Oorgaum now (1905). The origin of the Kolar Gold Fields is recorded in Rice Gazetteer as follows :- " In that year 1873 Mr. M.F. Lavelle, a resident in Bangalore, retired from the army, with some knowledge of geology, applied to the Government for the exclusive privilege of mining in the Kolar District, his thoughts being principally directed to the possibility of finding coal. His request was granted on certain terms.. On these conditions, Mr. Lavelle commenced operations by sinking a shaft in 1875, near Oorgaum. But finding that large capital would be required for carrying out the work, he next year, with the approval of Government, transferred all his rights and concessions to Colonel Beresford. This officer, with some friends amoung racing men, formed a syndicate known as the Kolar Concessionaires, whotook up the matter in earnest ... By 1881 the Concessionaires had secured the valuable aid of Messrs. John Taylor & Sons, a firm of mining Engineers in London. A general rush was then made for gold. ... Up to 1891, about ninety seven square miles in all had been leased out for gold mining, the land being situated in every district except Bangalore. ... In what was a desolate waste, a large flourshing town has sprung up, provided with most of the conveniences and institutions of European life. A branch railway on the standard guage, 10 miles in length, was opened in 1893, running from the Bowringpet junction to the Bangalore line through most of the principal mining properties, and has proved an immense convenience and success. The principal commodity carried by it is coal, to which may be added timber and machinery." The population rose from 7085 in 1891 to 37964 in 1901!! Recent discoveries (1905) have disclosed that the lodes have a tendency to run in a direction towards the Dharwar Gold Mines, which presumably form part of the same geological formation, and as far as can be calculated the mines are capable of yielding gold in average quantities for many years to come. Until the year 1902 all the machinery in the Mines was worked by steam power, but in August 1902 the completion of the Cauvery Power Works, brough about a complete revolution in the working of most of the Mines on the Fields, whereby 4000 H.P. of electric energy is transmitted to the Gold Fields from the Cauvery Falls Power Station received at an elaborate Transformer House centrally situated and distributed to the various mines in quantities contracted for and by the mneans of this electric power the majority of the mines work their milling and stamping machinery. The Kolar Gold Field water Supply Scheme was completed in 1901-1902. The water was drawn from the Bettamangala and Ramasagram tanks. Rotertsonpet suburb was established around 1901, and the name was given by the then H.H. the Maharaja in commemoration of the memory of Sir Donald Robertson, KCSI, late Resident in Mysore, on 15th August 1903. In the same year Kolar Gold Fields established a Corps known as the Kolar Gold Fields Volunteers, and earlier part of the Bangalore Rifle Volunteers . The Corps had its Head Quarters at Oorgaum. In Oorgaum, there was a Kolar Gold Field Club and Kolar Gold Fields Library in a building called Oorgaum Hall. In 1905, S.M. Pritchard (the Clubs Hon. Secy), H.H. Osborn (H. Treasurer), with R.R. Rodda. G.H. Burnell (Secy & Librarian), Committee members P. Bosworth-Smith, H.M.A. Cooke, Rev. L.G. Pollard. Some of the schools that existed then were Kolar Gold Field School, Nundydoog Mines (1901), St. Joseph's Convent Girl's School (Order of St. Joseph of Tarbes), Champion Reef, St. Thomas School. One of the bigger public instutions was The Kolar Gold Field Gymkhana Club, which hosted a Polo, Golf and Hockey team. St. Paul's Church (S.P.G. COE), which was shared with a Tamil congregation, the services at different times. Wesleyan Mission, English and Tamil congregations. Roman Catholic Churches, Our Lady of Victories (Champion Reef), which also covered St. Mary's Anglo-Vernacular School. Entertainment was provided by the Kolar Gold Fields Choral and Dramatic Society, and for the souls of many, the Royal Army Temperance Association was available. THERE IS ALSO A SITE ON KGF AT www.kgfonline.com please check it out (Address given to me by Dr. Dias, I could not get this site to work?). DUE TO LACK OF SPACE, THIS PAGE WILL NOT BE UPDATED ANYMORE. HOWEVER, FOR AN UPTO DATE COLLECTION OF INFORMATION, PHOTOGRAPHS, ETC., OF KGF, PLEASE GO DIRECTLY TO THE "NEW KGF PAGE", CLICK HERE. DATED: 8th JANUARY 2003!! The URL address of the new page is http://www.geocities.com/kolargoldfield ! .... Some Notes ... KOLAR GOLD FIELDS. (KARNATAKA) This little mining town, about 22 kms, east of Bangalore, was once the pride of the erstwhile Mysore state, and also that of India. This gold mine produced a sizeable amount of gold during the days of the British Raj. It employed nationals from Britain, Italy, Germany and also a good number of Angto -Indians. The entire labour force in those days, were the Tamils from the neighbouring state of Tamil Nadu, who were the best preferred for their honesty, ability to work hard and with no ties to labour unions. .
As the years rolled by, and the gold reserves diminished, coupled with the freedom struggle, the Expatriates began to leave the mines, though the British, who owned the mines still, held on to key positions. Anglo-indians were the next favoured kind and they took over many Administrative & , Managerial posts. Meanwhile the school of mines which was then started began to produce some good Indian Miners & Engineers, who were soon absorbed into Managerial levels on the mines. By this time the Central Government took over the Mines from the British and later handed over the Mines to the State Government. Gold reserves dwindled and the once prosperous Gold Mine showed signs of decline. Emigration was now in the air and the Anglo-indians were leaving India to greener pastures in large numbers. Some to U.K., some to Canada, Australia, New Zealand and even to some countries in Europe. The skilled personal left to the Gold Mines in Ghana, West Africa. 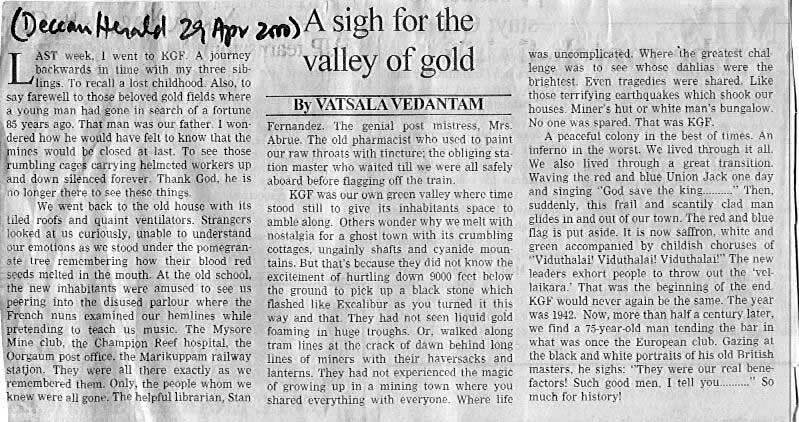 Talking of Kolar Gold Fields brings back old memories of the social life there, in those days. With four or five Clubs with facilities for Tennis, Billiards & Snooker (skittles on Sundays) and even a separate Golf Club, life was something very did@rent. The frequent Dances and social functions were something to be witnessed to believe. Come December, the whole place will be humming with activity. Dances, Christmas Trees, Gifts for children in all these Clubs, were the highlights of this festive season. Many from Bangalore would also come to these Dances at Kolar Gold Fields. Well Kolar Gold Fields is no longer the same, economically and socially. The posh Bungalows have been divided and sub-divided to accommodate more familes. The glass panes in the windows have been replaced by plywood when broken and the walls have not seen paint for quiet awhile. The then renowned KGF Club, which once was out of bounds for the Indians, is failing to bits The brass door handles, knobs and hinges have all gone. The highly polished floorboards have not seen wax for a few decades. The sterling silver cutlery which were specially ordered fcom 'the U. K for the Club's Restaurant with the emblem of the Club on it have all disappeared. There is not even cold beer on a summers Sunday morning to quench ones thirst. It is sad but that is an end of an era. This writeup above is by Mr. Valentine. He is a member of the Institute of Engineers and also a member of the Institute of Engineering Designers of U.K He started his career as a draftsman in KG. F in 1960. He went to Ghana in West Africa in 1974 and was later promoted as senior Design Engineer in the Gold Mines of Ashanti After 12 years abroad he has settled in Bangalore, India, and is now working in a Design & Drafting Section of an Engineering Project Management Firm, as a Manager. Update on K.G.F. ( Kolar Gold Fields ) January 1st, 2003!!. Here's wishing you all a Happy New Year 2003. This is Jan 1st, 2003, and I am just back from K.G.F.. Yes, I actually made it there for the New Year's Dance. I must say that I enjoyed myself. I congratulate the organizers for the excellent effort in the event. I was a bit sore as I missed about 2 hours of the dance due to a traffic jam on the Bangalore-Madras highway. We came in a group from Bangalore Sally & Reubin Fernandes (Saudi), Nimi & Faustin Fernandes (Canada), Lyn (Madras), Leslie & Althea and kids (Bombay), and of course yours truly Ronnie & Maisy (Bangalore). After a journey of over 4 hours that should have been actually 2 hours I gathered myself and took in the surroundings of the 'Skating Rink', my first impression was that of a 'Country & Western Barn Dance' and a very 'rustic' atmosphere, with corrugated roof, and tatty (cane) ceilings, propped by a large wooden door, and a stage to match. I have never been in surroundings like this, one sees it only in the movies. We came in 2 cars and unfolded ourselves, not really running for the tickets because we purchased them in advance through Ingrid and Maurice Rosario (thanks to them), whose son was playing in "The Last Resort" band. More about the band later. When I stepped into the hall or should I say 'Barn!!' , I was amazed to find such a lovely collection of lovely ladies and gents around the corridors. ( I have taken pictures of the dance, lets hope it will come out as my camera has a problem of too little flash and some leaking light, and above all lets hope that the darn film was loaded properly!!). The people seemed to look very friendly, but since we did not know anyone besides the Rosarios, I guess it's professional observance that is expected. Perhaps if I do venture and meet some more people, then people may smile and perhaps say 'Hello' to us strangers from Bangalore, who are visiting KGF for the first time!! Interestingly the scene of 100% Anglo-Indians in attendance, reminded me of the 'good old days' of Bangalore's 'Richmond Institute', 'Bowring Institute' and 'Catholic Club' functions. There was a 'King & Queen 2003' parade ... married and unmarried entries were accepted!! and the couple were selected by a panel of 3 judges and I think the result was ideal for a 'Grissom' ad? (sp). There was also the 'cats-eye' masks that is a traditional commodity amoung AI's. (I am curious why people did not get on the floor at Midnight wearing the masks, instead all were 'seated' at their tables?, while the old man went around with trumpet and drum band, and the New Year fairy was on the stage, too far to be really seen, giving her message for 2003, somebody should have taken her on a round to show how pretty she looked. Wonder if there is a reason for these traditions? The Band, The Last Resort, played excellent ball room dance music, and sang well. I guess they catered to the crowd, perhaps they should have had a session of Rock & Roll for the younger generation, or maybe some recorded music between breaks. The band played all night and were playing till 4 a.m. when we left back to Bangalore (puncture to make it still more eventful!!). Quite a strain on the boys. My wife Maisy's relations (a 3-day-old married couple, expectedly landed around 2 a.m.!!) Karen and Gibson won a prize for an elimination dance. I asked Maurice to introduce me to some people around and I met Mr. D.J. King, Dr. G.W. Dias and Mr. R. Simento ( I know his uncle in Brisbane, Australia ). I spoke to Dr. Dias about this web page and he welcomed the idea of putting the notice about a Fund for the Anglo-Indians in K.G.F., which you can find below. The Executive committee takes great pleasure in inviting Members of the Community in K.G.F. and from Bangalore to attend the Sixth Anniversary of the functioning of the above fund. Date: January 11th, 2003 ; Place: Skating Rink, Nundydroog; Time: 8-00 p.m. The Leading Band of K.G.F. "The Last Resort" will be there to keep you entertained through the night. Please Note: Reservations shouold be made on or before January 7, 2003 Final. Entrance not available at the door for any late comers. Dr. G.W. Dias, Phone: 360038, Mr. W. Orton, Phone: 360622, Mr. D.J. King, Phone: 361940, Ms. Sheola Monisse Phone: 360162. People who have sent in their contributions regarding requests for family information, records, and about people present, past and overseas. Also photographs.